One of the fab brands we are working with on Instagram, Bowties & Candyfloss, are launching their SS15 collection on Monday 25th May. There have been quite a few sneak peaks and us lucky reps have been sent a selection of the collection to wear. My boys have both been sent items from the collection and we are so happy with it all! It's a really fun unisex collection with a fruity feel to it so it's spot on for summer. Fruit, in particular, pineapples and melons are a really big trend this summer so Alex who runs Bows & Candy is bang on trend. Well done Mrs! The quality of the clothes is fantastic. It's lovely knowing that your child is wearing a fairly unique item, handmade by a WAHM in the UK. 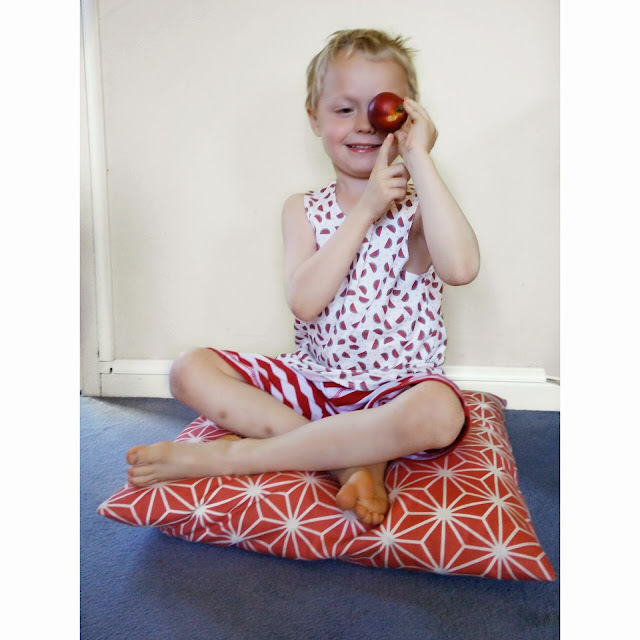 The material is soft, comfy and washes well. No bobbling! They are all practical as well. Alex made Ethan an exclusive romper as he's one of her older reps. The romper has poppers at the bottom just like it would for a toddler or baby.. but this is really handy! Ethan actually loves wearing "rompers" but mostly for older kids they are all in ones that you have to pull over your head or step into. Not very practical when it comes to using the loo! With this one Ethan can just undo the poppers and go to the loo! Nice and easy. I totally recommend you checking Bows & Candy out. It's good to support smaller UK businesses I think! Alex gives wonderful customer service as well and will sort out any issues in a flash. 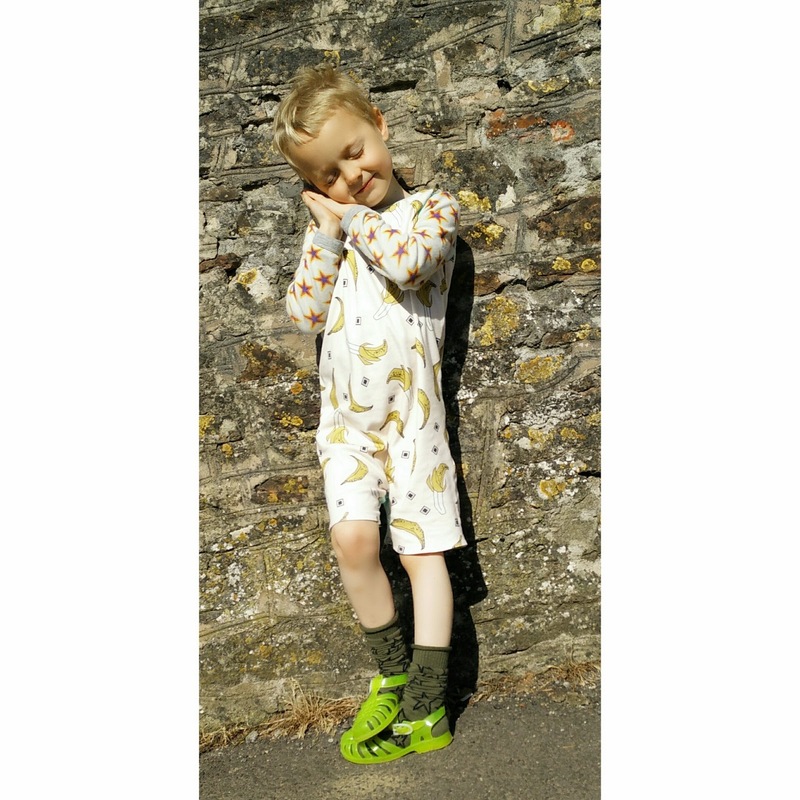 Got a kids fashion post? Link up below! Thank you to all who join in - please don't forget to link back to my blog in your post and/or display my Funky Kid Friday badge (see sidebar). If you tweet me your link I can RT it for you and I do my best to visit your post, comment and tweet your link again! 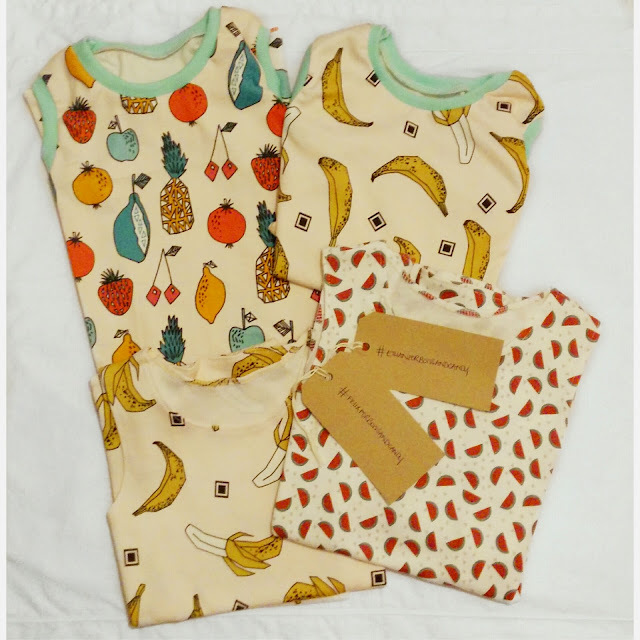 I love the bananas, especially with the green neck and how great to find rompers for older kids, they are so practical for playing!